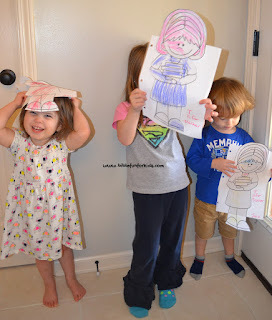 These preschool Bible lessons are created and used at home, so there are some basic preschool learning skills printables added to each post. To talk about the letter T, we looked at Jesus in the Temple when He was 12. The scripture for Jesus staying behind in the temple is found in Luke 2:40-52. When Jesus was 12 years old, the family made the yearly trip from Nazareth to Jerusalem. They were traveling with a group of people. When Joseph & Mary were finished worshipping God in the temple, they left Jerusalem with the group they were traveling with. Mary and Joseph didn't know that Jesus had stayed in Jerusalem. After a day of traveling, Mary and Joseph started looking for Jesus but they couldn't find Him! They asked their relatives and friends if they had seen Jesus. When Mary and Joseph didn’t find Jesus, they went back to Jerusalem to look for Him. Finally, after 3 days of searching for Jesus, they found Him in the temple! Jesus was sitting with the teachers. Jesus was asking questions and listening to their answers. When Joseph & Mary found Jesus, they were amazed that He was calmly sitting at the temple while they were so worried about Him! They asked Jesus "Why have You done this?" Jesus answered them saying 'Why are you looking for Me? Don't you know that I would be doing My Father's business? Jesus knew He was God's Son and that He was on earth to tell everyone about God. This is getting a double use! I needed a project for our 3 year old Wednesday night Bible class at the same time I was working on this post. So, I wanted to use something about studying God's Word. I like these kind of reviews for my 2nd grade glass because I can remind them of different people in the Bible, then bring everything they are learning to Jesus and what God wants from us now. In this study of people, I used Bible people that are talked about a lot and we just studied, so it is also a review. Directions are included. I also included the color and black & white. You can just print, cut and use. Click here to see an extended post with directions. To use: for instance, when you talk about Creation, they will put the Creation picture on the correct spot. Then as you are discussing Creation, they will find the match and add it next to the Creation picture. These can be glued or add an envelope to store the pieces on the back to reuse. T is for Teacher. I purchased this in a pack found here. I found turtle sun catchers at Wal Mart. They loved painting them! T is for Tiger and Turkey. The kids did not place the feathers and wings as the creator has pictured, so these look a little weird! I purchased both of these in the same set as the T is for Turtle below. You will find the free Alphabet Hats here. I purchased the T is for Turtle in this set here. 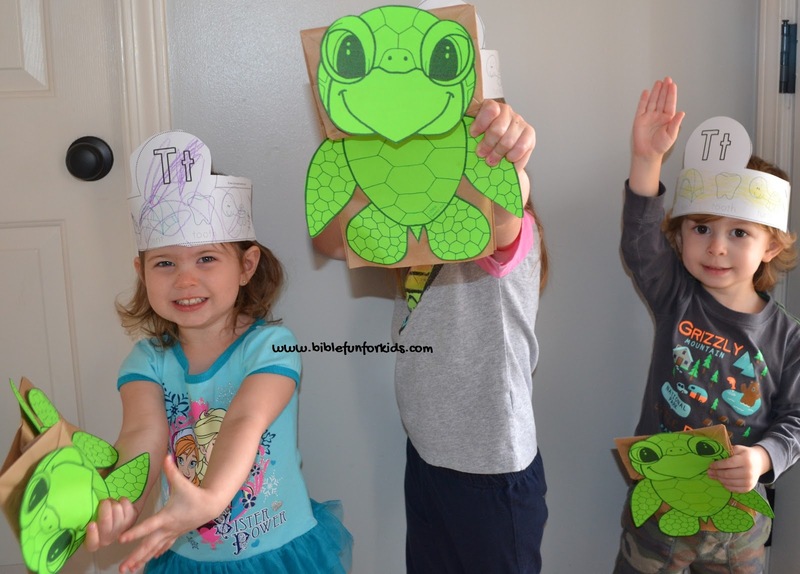 You can download the free turtle paper bag puppet here. And, they love long legged anything's, so I have been making all the shapes like this! You can download the template for this here. Here is a really cute long legged turkey freebie. The picture is from a post two years ago!. We made a turkey each week since we did these projects in November! They loved these Turkey headbands! I purchased it here. You can see more on my T is for Alphabet Board on Pinterest here. 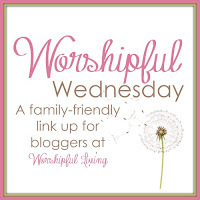 Thanks to Mandy for featuring this post! 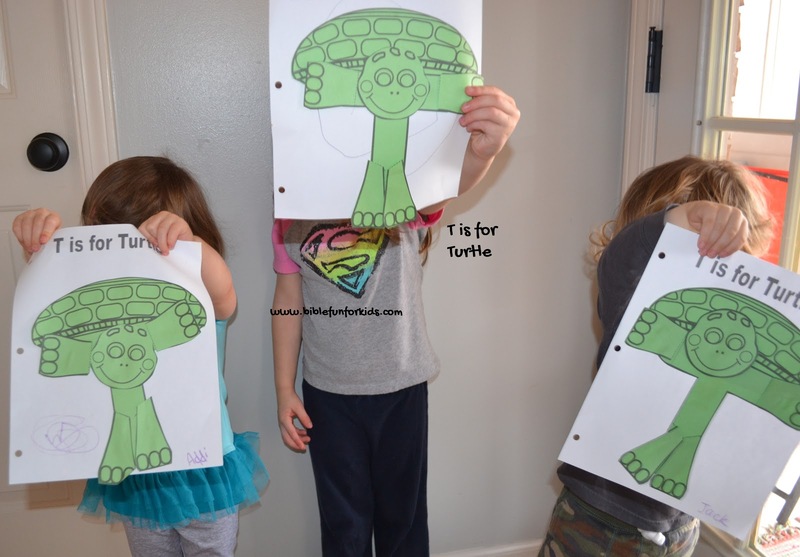 These look like fun ways to teach the alphabet. Using the Bible stories is also a great idea to help the children learn the truths. I'm your neighbor at #GiveMeGrace. Great post. What a great idea to use when teaching your children form the Bible. That long-legged triangle looks so fun to make. I can't wait to start making shapes and fun crafts like that when my baby is ready. Should be soon! 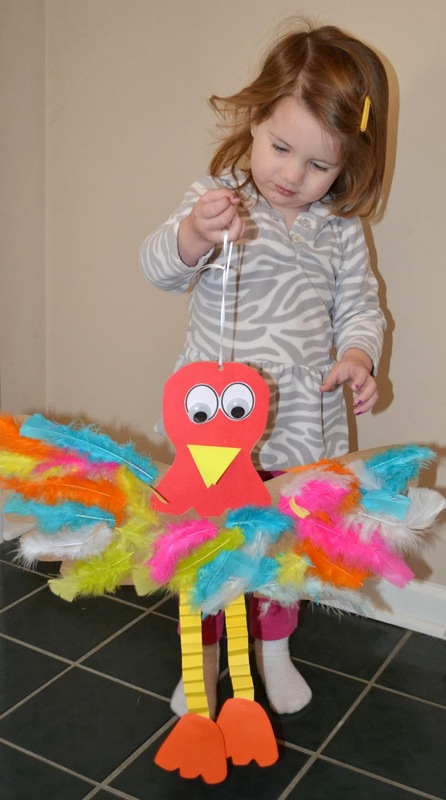 That turkey looks like a lot of fun to make AND to wear!